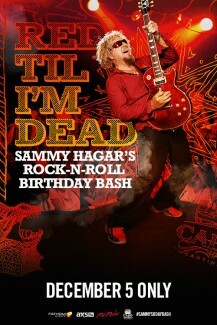 I've been celebrating my birthday in Cabo for almost 30 years and I couldn't begin to pick a favorite year,” said Sammy Hagar. “I’ve had hundreds of friends who’ve come down to perform and party. Each year is packed with so many insane collaborations and moments that I'm just happy that the rest of the world can finally get in -- and celebrate alongside us as it unfolds on the big screen. Sammy is bringing his epic multi-night birthday bash at his Cabo Wabo Cantina in Cabo San Lucas, Mexico to movie theaters nationwide on December 5, 2017. Cameras will be on hand to capture all the action at the rock legend’s world-famous bar for this exclusive cinema event including performances by Toby Keith, Chad Kroeger (Nickelback), Darryl McDaniels (Run DMC), Eddie Money, Vinnie Paul (Pantera), The Circle’s Michael Anthony, Jason Bonham, Vic Johnson and more! 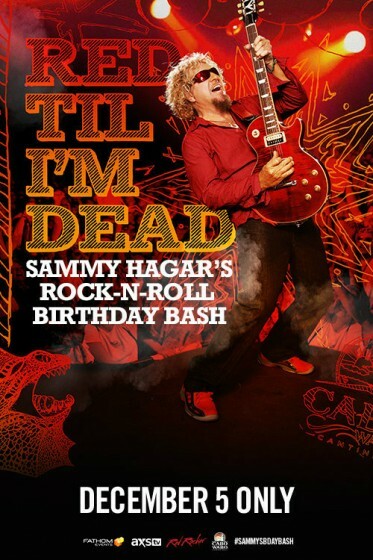 Presented by Fathom Events and AXS, “Red Til I’m Dead: Sammy Hagar’s Rock-N-Roll Birthday Party” will feature the best of the performances and party action from the four-day rock spectacular when it hits cinemas nationwide for one night on Tuesday, December 5 at 7:30 p.m. local time. Moviegoers will also enjoy a behind-the-scenes look at the music that spans the career of the one and only Red Rocker, plus birthday wishes from famous friends. Tickets can be purchased online beginning Friday, October 27 by visiting www.FathomEvents.com or at participating theater box offices. Redheads throughout the U.S. will be able to enjoy the festivities that surround the bash at a theater near you! I will be gathering the San jose Ca Redheads for Red till I am dead! hoping it will be in our area!